In Milan, right next to “Duomo”, there is the high glass arched ceiling, mosaic tiles floor, famous shopping mall “Galleria Vittorio Emanuele” where you can find some of the oldest restaurants like Savini restaurant, Biffi caffe and Zucca’s bar as well as expensive shops like Prada, LV and a MacDonald Cafe. 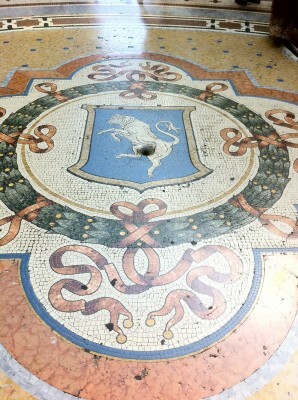 In the middle of the Galleria floor, there is a mosaic Turin bull. It is a Milanese tradition that if you place your right heel on the bull’s testicles ( now you can see a hole there ) and quickly spin 3 times without tripping (some say it is 1 time), then your wish will come true or it will bring you good luck. Would you like to try it next time you are here? This entry was posted in Fun Stuff, Travel and tagged Bull, Galeria VittorioEmanuele, lucky, Toro. Bookmark the permalink. Nice post, thanks. Do you have a Youtube account? Thanks. I have never posted anything on Youtube. I just clearly realize all you mentioned. In reality, I just looked at through your a few other articles or blog posts and I believe that you’re 100 % . Congrats this particular web pages. Any other website owners ought to get this website as an example , rather clean and good surfer favorable trend . I just undoubtedly agree with everything you include proclaimed. In fact, Simply put i read using your several blogposts but you must be unquestionably right. Wonderful utilizing ths blog site. Thanks a ton, I’ve just been looking for the informatioin needed for this method content temporarly while and your own is a good I’ve discovered now. In spite of this, what exactly relating to final conclusion? Are you currently good with regards to the availability?